After I was finished making the package above, I had another idea. This time I made a sheet of daisies with different colored centers that have been topped with Crystal Effects to make them shiny and give them dimension. So fun!! I have lots of other ideas for Card Candy that I will be trying out over the next few months, so you'll be seeing more of these. 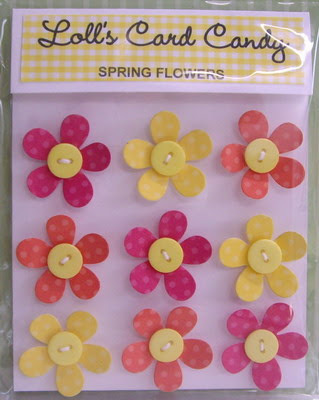 I have made another package of both candy (spring flowers and daisies). If you are interested and are a member of my blog, please leave a comment on this post. In one week's time, I will use a random number generator to pick one person. I'll announce the name and ask that person to email me with their address so I can mail off the packages of candy. Again, to all of you that take the time to look at my cards ... and especially to those who also take time to comment .... thank you!! What a cute idea!! Love them both and would be so useful to have on hand when you need to put a card together really fast. Awesome!! I love your idea and those card candi packages look amazing! Loll, you are incredible! Your cards are always breathtaking and now you've come up with this delightful card candy! What a neat idea, Loll and such beautiful packaging! How nice of you to share these as well as your incredible talent! I love both the spring flowers and the daisies. So springy and daisies are my favorite flowers (carried them when I got married 32 years ago). Always look forward to seeing your blog and oohing and aahing at your cards. You are so clever. I did a quick peek and said to myself wherever did she get those. After I read your entire piece WOW you blew me away. I love your cards and your blog. Thanks so much for the inspiration. Wow! How cute are those flowers!! Thanks for a chance to win and for all your good ideas. I enjoy your blog so very much! Oh my goodness, Loll, what a fabulous idea - sweet, sweet, sweet! These have your fresh, clean, crisp style, which you know I love!!! How sweet of you to create these handmade goodies and even more sweet to share them with all of us!!! Love them! What a great idea! I'd never thought of making some up ahead of time to add to my stash. That is a cool idea, I love it! /such a darling idea!! Thank you for your inspiration and sharing these with us. Very professional! So adorable. I never thought to put glaze on brads like that. 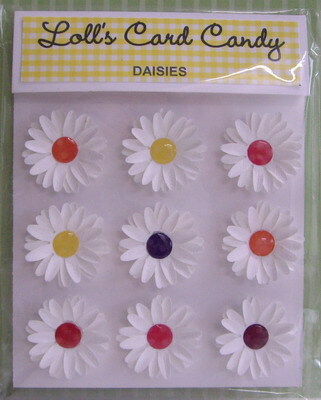 Love the polka dots and love the multicolored middles on the daisies. Beautiful job! I am a relatively new follower but am glad to be here. I've had a chance to look at some of your previous posts and really like what I see. Love your card candy, Loll - what a brilliant idea! I can't wait to see the other ones you come up with! I love these! They are adorable! I would love to win them! Thanks for the chance to win! Wow Loll! I thought you started your own business! They look amazing! Your little flowers with the buttons are darling and your packaging is awesome too! The daisies with the crystal effects are so cute! Really wonderfully done! I love your stamping page, the tips and tutorials. Your cards are so simple yet elegant. Loll, your talents know no bounds, I visit you blog daily, and you have your own page on my pinterest sight, as I LOVE your work, so very inspiring, thanks so much for all you do, and these flowers are so very precious, and would be so handy to have on hand to work with, would love to own a set!!! Wow...what a clever idea...I will have to try that, what great gifts to give. Your card samples always put a smile on my face. What sweet and pretty card candies! Sometimes it's these sweet touches that really make the card special! Here it is supposed to be Spring and we had a high of 25 degrees and snow flurries all day. So nice to visit your blog and SEE Spring!! Wow, Lolly, your card candy is adorable and looks so professional!! I'd love to have some, but as you know I've got too much stuff to be decent, so I'd rather leave the chance to someone with less. They look like they took a lot of care and effort! Let me know if it turns into a little business as I will support you! Those are so spring-y and colorful! Ty so much for the chance to win! Love your card candy. Great idea!!! Always enjoy checking out your cards and ideas. Your flowers are wonderful! Love your blog and your fantastic cards! I love your card candy. So cute...and you even made your own packaging. Your cards are always an inspiration. I love the flowers and would love to win them! These are gorgeous, Loll, very professionally created and packaged. I love those spring colours you've used - perfect antidote to the snow that's swirling around outside just now. I'm one of your newer followers Loll.. I only joined earlier this week as I've seen lots of your cards on Pinterest... they're fab - I love your style and have been inspired by quite a few! And wow to how you've made and packaged these... and I'd love to be in with a chance of winning them! Wow, what a great idea! And your flower candy bags look so beautiful. Those flowers are adorable. I follow your blog all the time and love your work, often copy it. I want some card candy. Very SWEET! Thanks for the chance. I love your cards. Love, LOVE these flowers and the way you packaged them...SO pretty and Spring-y! :0) I look forward to coming to your blog everyday to be inspired...thank you! You are so creative and inspiring. Thanks for this latest idea. It is adorable! Loll your candy is amazing those flowers are flawless ! Beautiful bright colours and perfectly crafted, the packaging is fabulous too. Look forward to seeing more of these in the months to come. Your card candy is so sweet I'd love to make some cars with them. Loved the cards you did, simple but just darling. The daisy card candy is particularly wonderful and the way you have used both your button flowers and daisies recently really show Spring! Can't wait for it to get here in MN. What a great idea - give away something springy! THese are adorable as well as the cards you made using them. Thanks so much for the inspiration! I LOVE checking your blog to see your latest creation! I really like your style. Thanks SO MUCH for sharing. Love these adorable flowers - can't decide which one I like better, so I would love to have both! Thanks for a chance to win them! If I don't win a set of these adorable flowers, I sure hope you make them available for sale. I've seen them on Pinterest and can't wait to use them on my cards!! How nice of you to be sharing them with us!! If Friends were Flowers ... I'd pick YOU!